Below is a simple script for grant the Ou-permission what are required when deploying Lync 2013 in a restricted or locked down domain/AD. The below link reference 6 of the attributes that have to have the permissions set. Like most Clients there is never just one container level, and many clients AD drills down through many container levels. Because of this setting the grant-oupermissions would be impossible to do manually, therefore below is a little noddy script which would read an csv. file and upload the contents based on the attributes. Add the .csv file name to the prompt and sit back and watch the updating commence. This is something that i get asked a lot. ‘How do you do the Cu updates to Lync 2010 or 2013’. I know some people find the wording from Microsoft on how to install a bit daunting, so therefore below ive created a mini guide on how to complete the install using basic english so it can be followed. Firstly in this blog im going to go ahead and update my Lync2013 lab with the new CU1 update which was posted from Microsoft a week or so ago. Link to the update can be found here. One execution of the .exe you will be presented with a dialog like the below. This dialog tells you which parts of your Lync system will be updated. Now its a simply select of the Install Updates button. Dependant on your server build/spec, the update can take a number of minutes to complete. Once its finished you should see a green tick in the completed update components. Now that is complete do the same as we have done above on all the other Lync Servers <front ends, Edge, ArchMon, Persistent chat, Director Servers>. Now onto the less understanding piece from Microsoft. <<After you install the update for the Core Components server role on a Lync Server 2013 Enterprise Edition front end server or on a Lync Server 2013 Standard Edition server, the updated SQL database files are dropped to the machine that has the Core Components server role installed. To apply the database changes, you have to run the applicable cmdlets below. Note The –Update parameter is not required when you run the Install-CsDatabase cmdlet to update the Lync Server 2013 databases. So what does this actually mean.? Simply put for some reason unknown to me? When you run the update the Frontend server loose site/connection to the backend lync databases which is either collocated as you are a Standard Edition deployment OR located on a external SQL Server if you are Enterprise Edition. In the case of our lab we are enterprise edition so we need to specify the external SQL Server to update. 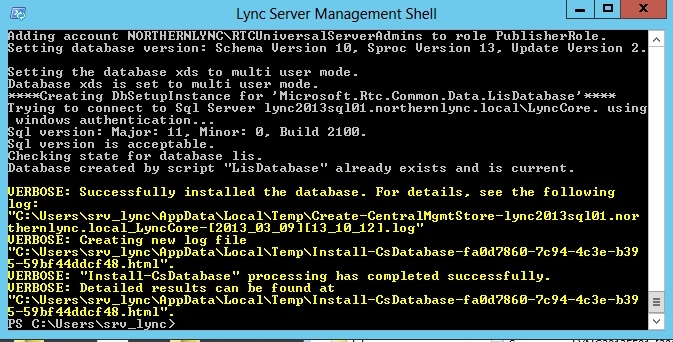 ALSO – Please check if you are mirroring your Lync2013 build, as the command is slightly different?!! and its a little more intensive to complete. Once this is complete you should see the successful yellow verbose messages. Again once this is complete we have the final command to run. So where is the CMS database?? this is a good question and one that is sometimes confusing to find out. Using this simple powershell command you can see where your CMS database is located. This should take seconds to run. 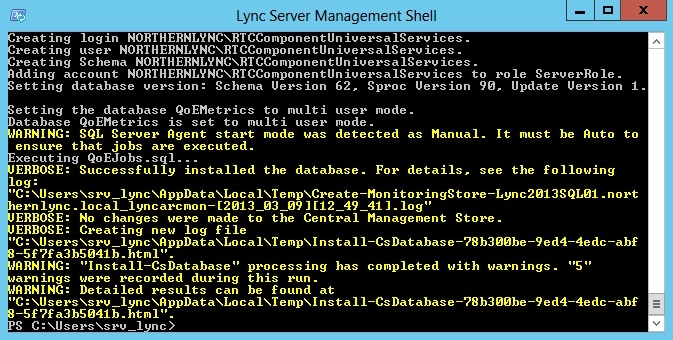 ****NOTE: you run this from the command Prompt NOT Lync Management shell..!! Thats it.. you are now updated in total. 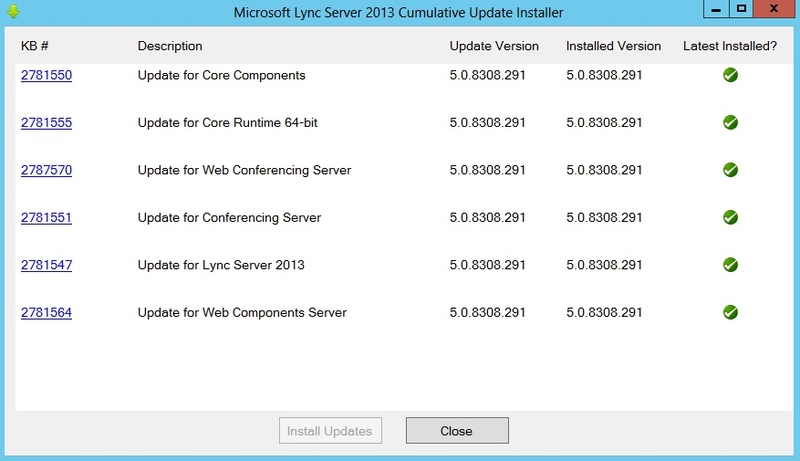 enjoy the new features what comes with CU1 on Lync 2013.